The Pantheon is a building in Rome which was originally built as a temple to the seven deities of the seven planets in the Roman state religion, but which has been a Christian church since the 7th century. It is the best-preserved of all Roman buildings and the oldest important building in the world with its original roof intact. It has been in continuous use throughout its history. 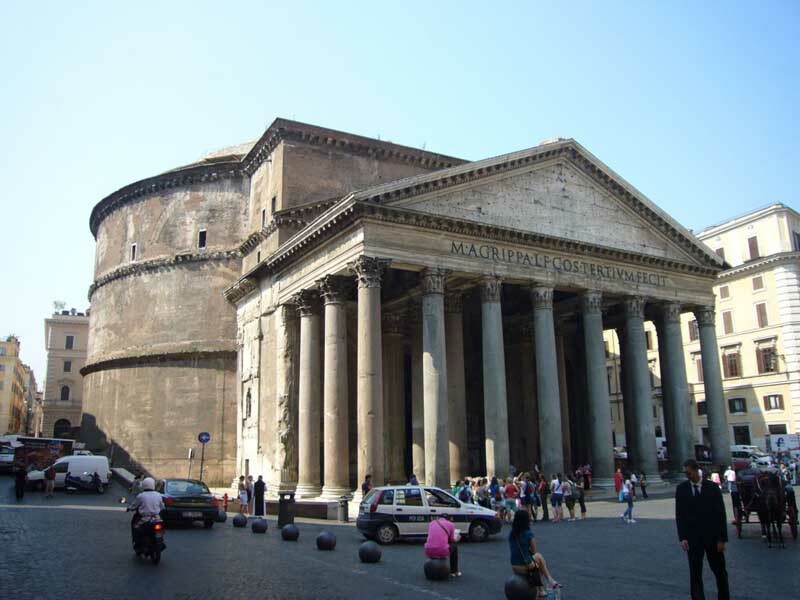 The original Pantheon was built in 27-25 BC under the Roman Empire, during the third consulship of Marcus Vipsanius Agrippa, and his name is inscribed on the portico of the building. The inscription reads MáAGRIPPAáLáFáCOSáTERTIUMáFECIT, "Marcus Agrippa, son of Lucius, consul for the third time, built this." It was originally built with adjoining baths and water gardens. 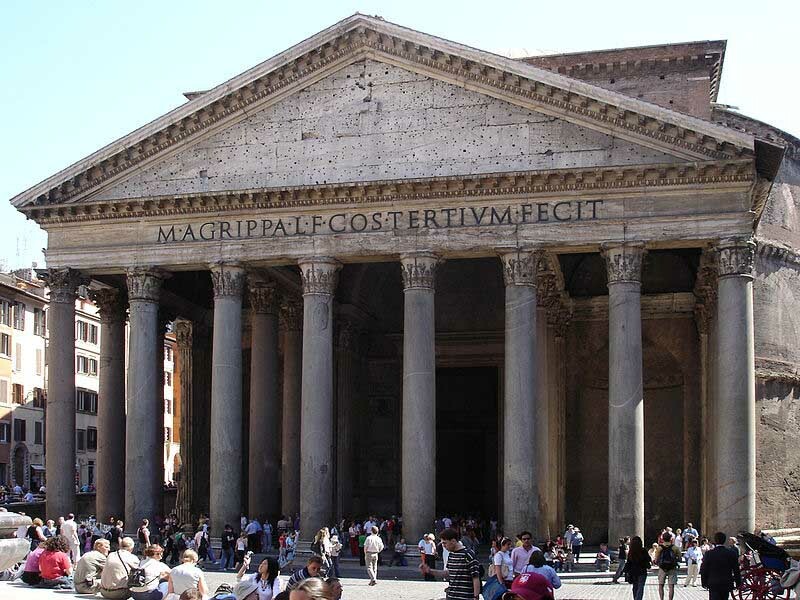 In fact, Agrippa's Pantheon was destroyed by fire in AD 80, and the Pantheon was completely rebuilt in about 125, during the reign of the Emperor Hadrian, as date-stamps on the bricks reveal. It was totally reconstructed, with the text of the original inscription (referring to Agrippa) added to the new facade, a common practice in Hadrian's rebuilding projects all over Rome. The building was later repaired by Septimius Severus and Caracalla.Hadrian was a cosmopolitan emperor who traveled widely in the east and was a great admirer of Greek culture. He seems to have intended the Pantheon, a temple to all the gods, to be a sort of ecumenical or syncretist gesture to the subjects of the Roman Empire who did not worship the old gods of Rome, or who (as was increasingly the case) worshipped them under other names. In 609 the Byzantine emperor Phocas gave the building to Pope Boniface IV, who reconsecrated it as a Christian church, the Church of Mary and all the Martyr Saints (Santa Maria ad Martyres), which title it retains. The building's consecration as a church saved it from the abandonment and spoliation which befell the majority of ancient Rome's buildings during the early mediaeval period. The only loss has been the external sculptures, which adorned the pediment above Agrippa's inscription. The marble interior and the great bronze doors have survived, although the latter have been restored several times. During the reign of Pope Urban VIII, the Pope ordered the bronze ceiling of the Pantheon's portico melted down. Most of the bronze was used to make bombards for the fortification of Castel Sant'Angelo, with the remaining amount used by the Apostolic Chamber for various other works. It is also said that the bronze was used by Bernini in creating the baldachin above the main altar of St. Peter's Basilica, but according to at least one expert, the Pope's accounts state that about 90% of the bronze was used for the cannon, and that the bronze for the baldachin came from Venice. This led to the Latin proverb, "Quod non fecerunt barbari, fecerunt Barberini" ("What the barbarians did not do, the Barberinis [family name of Urban VIII] did").In the 15th century, the Pantheon was adorned with paintings: the most famous is the "Annunciazione" by Melozzo da Forl“. Since the Renaissance the Pantheon has been used as a tomb. Among those buried there are the painters Raphael and Annibale Caracci, the architect Baldassare Peruzzi and two kings of Italy: Vittorio Emanuele II and Umberto I, as well as Vittorio Emanuele's Queen, Margherita. Although Italy has been a republic since 1946, volunteer members of Italian monarchist organisations maintain a vigil over the royal tombs in the Pantheon. This has aroused protests from time to time from republicans, but the Catholic authorities allow the practice to continue, although the Italian Ministry of Cultural Heritage is in charge of the security and maintenance. The Pantheon is still a church and Masses are still celebrated in the church, particularly for weddings. The building is circular with a portico of three ranks of huge granite Corinthian columns (eight in the first rank and two groups of four behind) under a pediment opening into the rotunda, under a coffered, concrete dome, with a central opening (oculus), the Great Eye, open to the sky. A rectangular structure links the portico with the rotunda. In the walls at the back of the portico were niches for statues of Caesar, Augustus and Agrippa. The large bronze doors to the cella, once plated with gold, still remain, but the gold has long since vanished. The pediment was decorated with a sculpture in bronze showing the Battle of the Titans - holes may still be seen where the clamps which held the sculpture in place were fixed. The height to the oculus and the diameter of the interior circle are the same (43 metres, or 142 feet 6 inches), so the whole interior would fit exactly within a cube (alternatively, the interior could house a sphere 43 metres in diameter). The dome is the largest surviving from antiquity and was the largest dome in western Europe until Brunelleschi's dome of the Duomo of Florence was completed in 1436. It was covered with gilded bronze plates. The interior of the roof is intended to symbolize the heavens. The Great Eye, 27 feet across, at the dome's apex is the source of all light and is symbolic of the sun. Its original circular bronze cornice remains in position. The interior features sunk panels (coffers), which originally contained bronze star ornaments. This coffering was not only decorative, however but reduced the weight of the roof, as did the elimination of the apex by means of the Great Eye. The top of the rotunda wall features a series of brick-relieving arches, visible on the outside and built into the mass of the brickwork. The Pantheon is full of such devices - for example, there are relieving arches over the recesses inside - but all these arches were, of course, originally hidden by marble facing.It may well be noted that the proportions of the building are in discord with respect to the classical ideal. Most evident is the rather large pediment, which appears far too "heavy" for the columns supporting it. The reason for this was the expectation that the building would be much taller than it actually is, which would affect larger columns. However, by the time the pediment was built, it was realised that the supply of imported stone for the columns were not enough to build to its anticipated height and thus the builders had to settle with a building that is somewhat out of proportion. 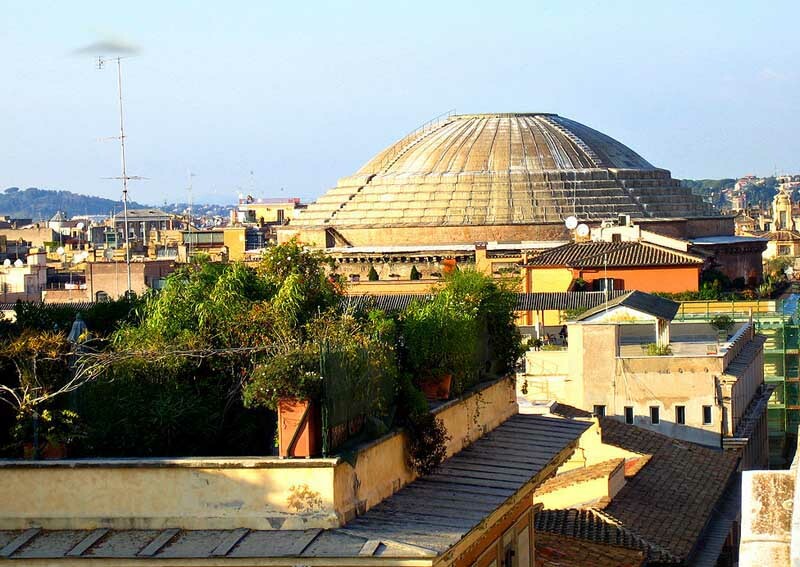 The composition of the Roman concrete used in the dome remains a mystery. 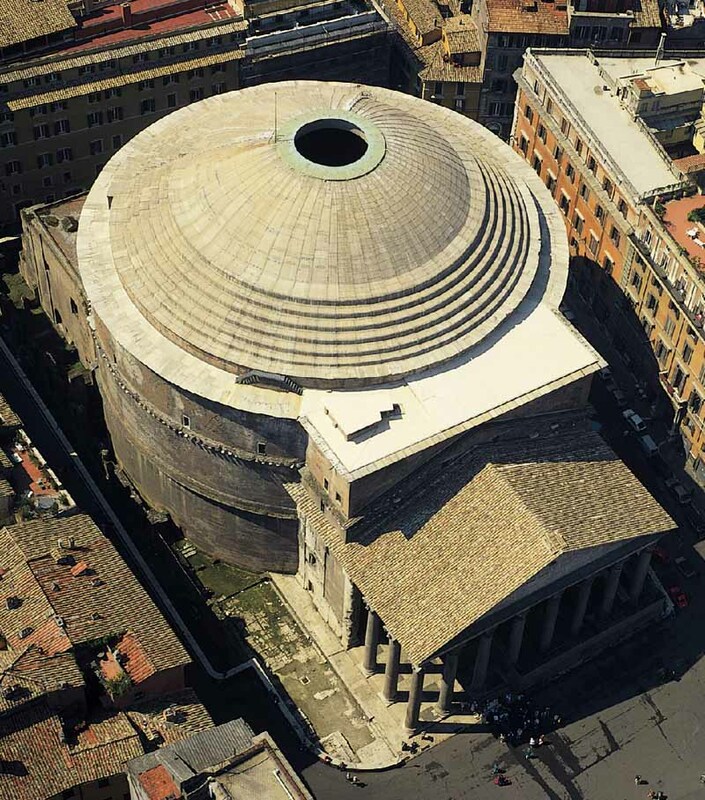 An unreinforced dome in these proportions made of modern concrete would hardly stand the load of its own weight, since concrete has very low tensile strength, yet the Pantheon has stood for centuries. It is known from Roman sources that their concrete is made up of a pasty hydrate lime; pozzolanic ash from a nearby volcano; and fist-sized pieces of rock. In this, it is very similar to modern concrete. The high tensile strength appears to come from the way the concrete was applied in very small amounts and then was tamped down to remove excess water at all stages. This appears to have prevented the air bubbles that normally form in concrete as the material dries, thus increasing its strength enormously. 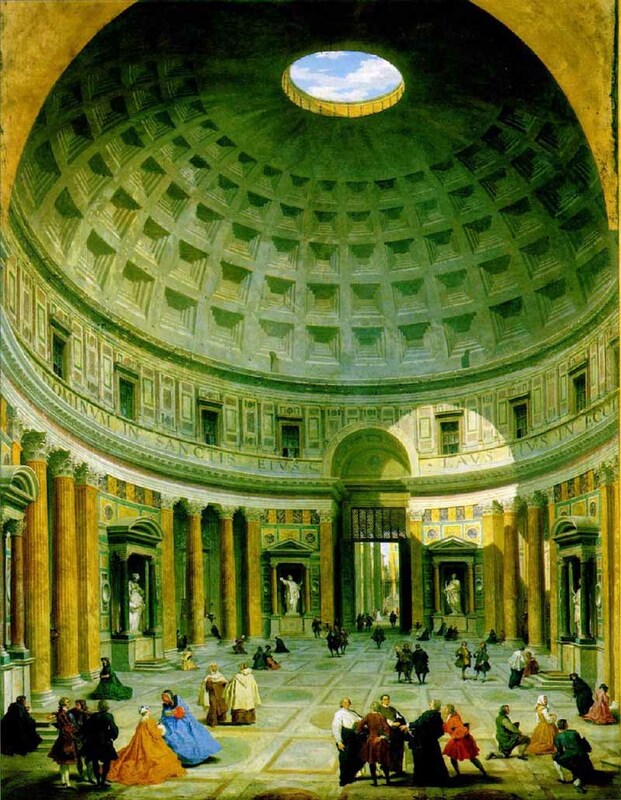 As the best preserved example of monumental Roman architecture, the Pantheon was enormously influential on European and American architects from the Renaissance to the 19th century. Numerous city halls, universities and public libraries echo its portico-and-dome structure. Examples of notable buildings influenced by the Pantheon include Thomas Jefferson's Rotunda at the University of Virginia, Low Library at Columbia University, New York, and the State Library of Victoria in Melbourne, Australia. Some changes have been made in the interior decoration, however. Much fine marble has been removed in the course of the centuries, and there are capitals from some of the pilasters in the British Museum. Has the grand Roman Pantheon been keeping a secret for nearly 2000 years? An expert in ancient timekeeping thinks so, arguing that it acts as a colossal sundial. The imposing temple in Rome, completed in AD 128, is one of the most impressive buildings that survives from antiquity. It consists of a cylindrical chamber topped by a domed roof with an oculus in the top which lets through a dramatic shaft of sunlight. It boasts a colonnaded courtyard at the front. 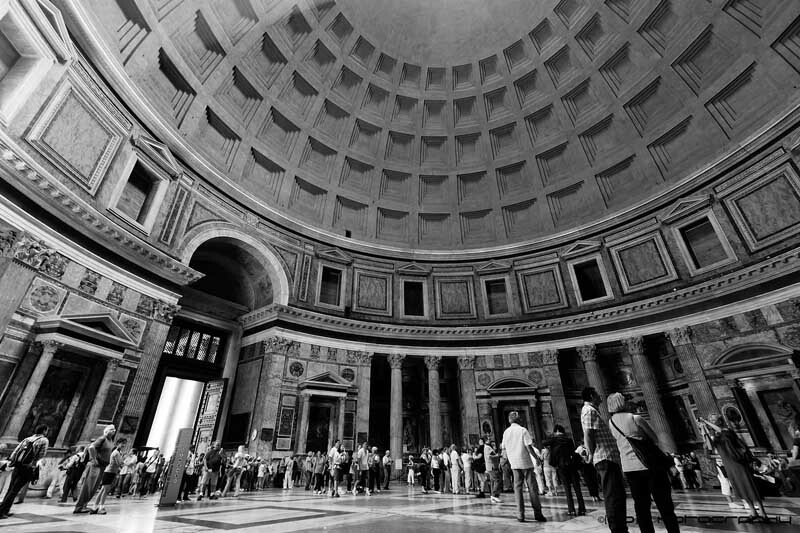 When Robert Hannah of the University of Otago in Dunedin, New Zealand, visited the Pantheon in 2005, researching for a book (see "Review: Time in Antiquity by Robert Hannah"), he realised that the Pantheon may have been more than just a temple. During the six months of winter, the light of the noon sun traces a path across the inside of the domed roof. During summer, with the sun higher in the sky, the shaft shines onto the lower walls and floor. At the two equinoxes, in March and September, the sunlight coming in through the hole strikes the junction between the roof and wall, above the Pantheon's grand northern doorway. A grille above the door allows a sliver of light through to the front courtyard - the only moment in the year that it sees sunlight if its main doors are closed. Hannah reckons this is no coincidence. A hollowed-out hemisphere with a hole in the top was a type of sundial used in Roman times, albeit on a much smaller scale, to show the time of year. 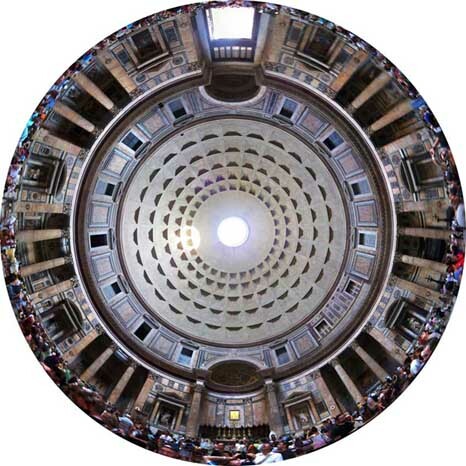 While the Pantheon's dome is quite flat on the outside, it forms a perfect hemisphere inside. "This is quite a deliberate design feature," says Hannah. Pantheon means "all of the gods" and the building's roof represented the dome of the sky, where Romans believed the gods resided. At equinox, the sun is on the celestial equator - where Earth's equator would lie if projected into space - which was seen as the most stable part of the sky, a perfect eternal home for the gods. Hannah thinks that by marking the equinoxes, the Pantheon was intended to elevate emperors who worshipped there into the realm of the gods. James Evans, a historian of astronomy at the University of Puget Sound in Washington state, is intrigued: "The architect of the Pantheon would certainly have been aware of the symbolic connections between the cosmos and the empire, and between the sun and the emperor." He doesn't believe the case is proven, however, as no markings survive in the Pantheon that relate to a sundial.